The 2013 Honda Fit has proven to be a great car for Middletown and Mahwah drivers looking for a low-cost, compact, well-equipped vehicle. Like the rest of Honda’s line, it comes with a strong reputation for safety and strong performance. The 2013 Chevy Sonic is a similarly-priced vehicle in the subcompact vehicle class. 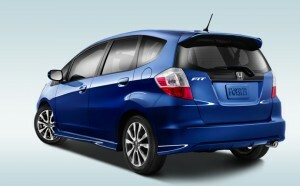 But with a better fuel economy, and more standard features, some drivers may prefer to go with the 2013 Honda Fit. We’ll take a closer look at both models. Drivers expect to get as many miles as they can out of each gallon on a subcompact vehicle. The 2013 Honda Fit with automatic transmission gets an EPA estimated 31 mpg combined rating, compared to the 28 mpg average on the Chevy Sonic. That adds up to big fuel savings over the vehicle’s lifetime. The Fit also has a total cargo volume of 20.6 cubic feet, compared with the 14.9 cubic feet available on the Sonic. This means more room for groceries, gear, or whatever you need to pack along. We invite you stop by Middletown Honda for a test drive of the 2013 Fit. We’re located on Route 211, right next the GanderMountain. We’re just a short drive away from Mechanicstown too. As one of the most trusted names in Honda sales around OrangeCounty, we’re pleased to continue to offer Honda’s current line-up. If you have any questions about the Honda Fit, please contact Middletown Honda. * 27 city/33 highway mpg rating for Fit and Fit Sport with manual transmission. 28 city/35 highway mpg rating for Fit with automatic transmission. 27 city/33 highway mpg rating for Fit Sport with automatic transmission. Based on 2013 EPA mileage ratings. Use for comparison purposes only. Your actual mileage will vary depending on how you drive and maintain your vehicle.